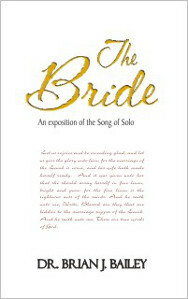 Dr. Brian Bailey’s book The Bride is a fresh and penetrating, verse by verse, exposition of the Song of Solomon. With remarkable clarity of vision we are shown the development of that grand and glorious love relationship between Christ and His bride. This little book so inspiringly portrays the role of the Bridegroom in our lives, that the reader becomes overwhelmed with a fervent hope and desire to become more like Him. We are also given that blessed hope that with right steps, we can and will reflect the divine image of our Creator. Do you sense your need for an awakened heart? Do you desire to be quickened and drawn to Him? Do you want to have the beauty of Christ’s character formed and developed in you? Do you long for your fellowship with God to be further established and enlarged beyond your present experience? Then this is the book for you.